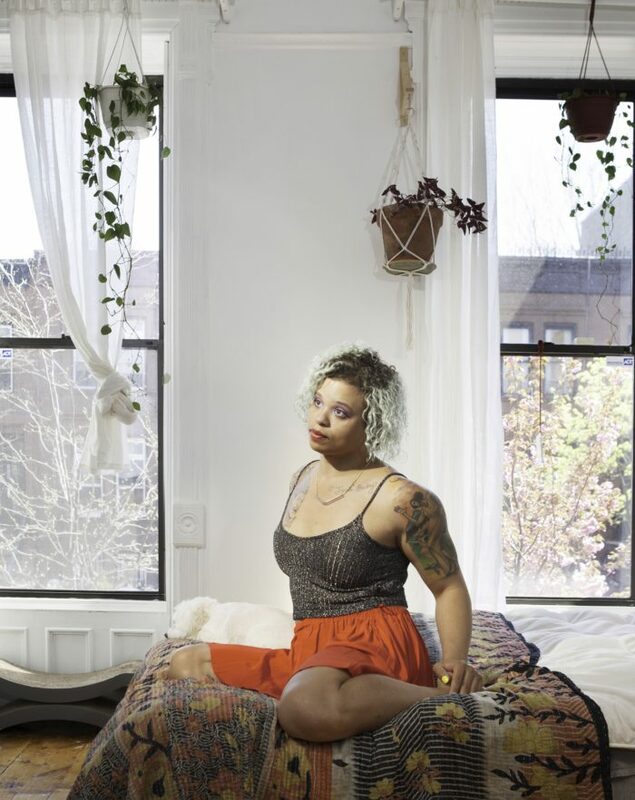 Reina Gossett at her Brooklyn home, 2018. Reina Gossett strives to live her predecessors’ legacy. It comes from a conduit of empathy, one that flows through the trans activist and filmmaker’s various projects—spanning community organizing to editing an award-winning anthology on trans cultural production. Through it all, Gossett has learned that it’s the radicality of daily lived experience that goes the furthest, something she picked up from revolutionary trans matriarchs like Marsha P. Johnson and Sylvia Rivera, “the people who created space for me to live my life as much as possible,” she says reverently. She values the unruliness of her idols, to whom she pays homage in her archival research and films oriented around black trans trailblazers. “It’s a theme in my work,” Gossett explains, “to honor those who came before me, who were doing things they considered to be small everyday things that actually had a tremendous impact on the world.” This includes an animated short film, called The Personal Things (2016) about Miss Major Griffin-Gracy, whose gesture of changing her gender back to “male” on her driver’s license struck Gossett as the type of action that creates tangible progress. “She initially changed her identification for safety reasons, in places like bathrooms, but then decided that she wanted people to acknowledge her as transgender, to love her for that, not for being on one side of the gender binary or the other,” explains Gossett. Earlier this year, several of Gossett’s projects came to fruition. “It feels like this magic moment of culmination,” Gossett says as we sit in her sun- bathed Brooklyn brownstone, an oasis of plants and lush DIY touches, such as a panel of pale pink satin covering the upstairs entry door and a fireplace mantle with the aura of an ancestor worship altar. One can feel the deep pleasure in Gossett’s words. She finally saw her years-in-the-making short film, Happy Birthday, Marsha!, co-directed with Sasha Wortzel, premiere at Outfest in Los Angeles this past spring after appearing in “Trigger: Gender as a Tool and a Weapon” at the New Museum this winter. HBD, Marsha! centers on a transgender black woman, Marsha “Pay It No Mind” Johnson, in the hours leading up to the Stonewall Riot, in which she took a pivotal stand against the brutal police violence on a night that’s widely considered to be the birth of gay liberation. While a slew of biases has separated Johnson from the recognition she deserves—racism, anti-blackness, transphobia—Gossett’s archival deep dives and oral history collection evoke Johnson’s spirit, memorializing the complicated, contradictory, glamorous caregiver that lives on despite her tragic death in 1992. Rather than a straightforward documentary, Gossett and Wortzel’s HBD, Marsha! disrupts the very convention we use to honor historical figures, opting for a filmic experience more in line with Johnson’s legacy and Gossett’s own experience of self-discovery. Archival footage from 1991 is blended with a fanciful narrative that is executed with vanguard cinematographer Arthur Jafa. Johnson is played by Tangerine star Mya Taylor and supported by a cast of intergenerational trans, gender non-conforming and queer pioneers, including Grace Dunham, Jay Toole and Egyptt LaBeija. There is a sweeping energy in this experimental tale, especially as pure cacophony erupts when Johnson walks through the threshold of Stonewall. That spirit is also mirrored in Gossett’s short film, Atlantic is a Sea of Bones, commissioned for the Visual AIDS Foundation’s longstanding “Day With(out) Art” project. As the central role “Egyptt,” LaBeija grieves the loss of community due to the AIDS epidemic, though she finds solace in a guiding force played by the engrossing Jamal Lewis. These films simmer with radical, aestheticized joy, even as the threat of violence, both past and present, looms. Heading into summer, Gossett is anticipating a proper New York premiere for HBD, Marsha! and is in research mode for her next film, details of which the filmmaker is keeping close to the chest for now, though Marsha’s legacy will always be on her mind. “My next film is going to be about many of the same themes, but it’s going to be set in a different moment of time,” is the only hint she offers. With her films that often forge into erased pasts, it will be interesting to see what Gossett chooses to shed light on next, in order to create futurity for herself and her community.